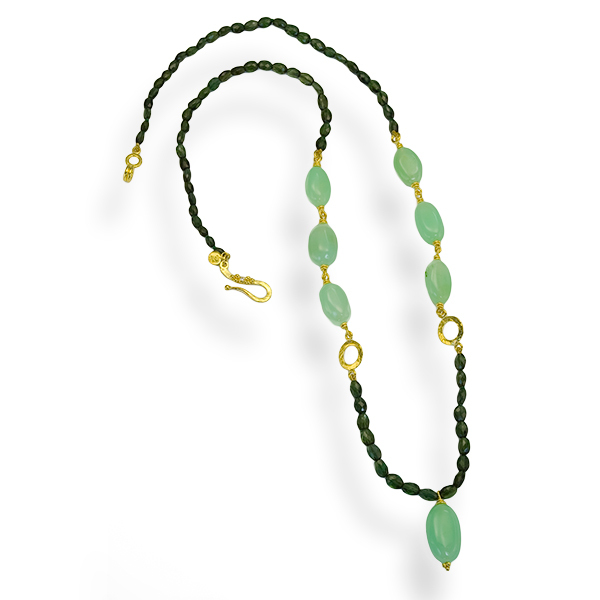 Necklace has one strand of Green Tourmaline oval faceted beads and Kosovo Opal beads with 22kt yellow gold links, a Kosovo Opal drop and an 18kt yellow gold hook clasp set with a Diamond (.015cts), 24″ total length. 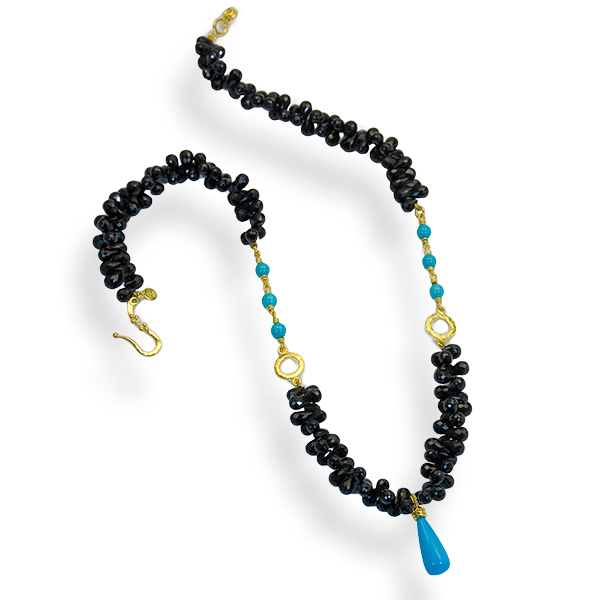 Necklace has one strand of Black Spinel Briolettes and Sleeping Beauty Turquoise beads with 22kt yellow gold links, a Sleeping Beauty Turquoise briolette drop (18.4×8.06mm, 6.95cts) and an 18kt yellow gold hook clasp set with a Diamond (.015cts), 19″ total length. 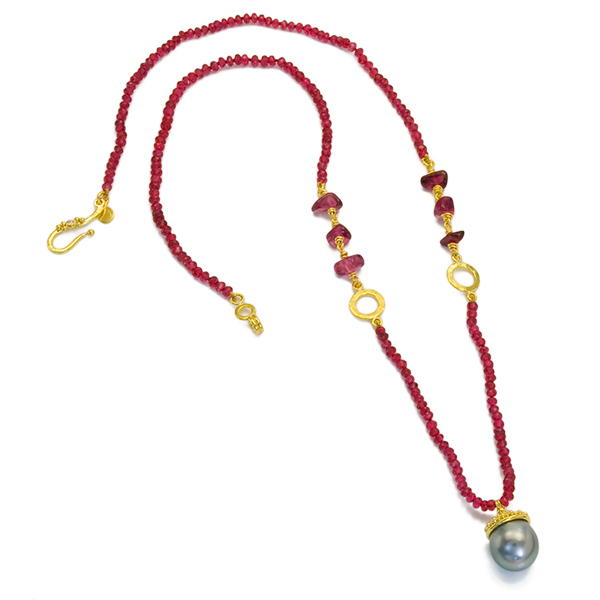 Necklace has one strand of Red Spinel faceted beads and Pink Tourmaline nugget beads with 22kt yellow gold links, a Silver Tahitian Pearl drop ((12.5x13mm) set in granulated 22kt yellow gold and an 18kt yellow gold hook clasp set with a Diamond (.015cts), 23″ total length. 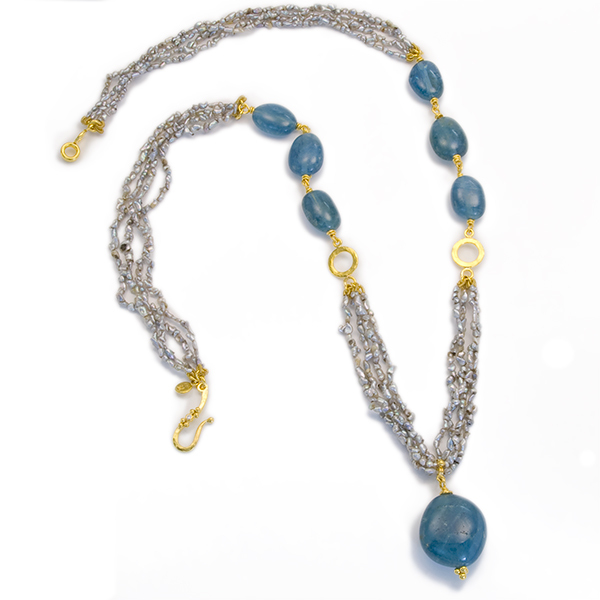 Necklace has four strands of Gray Keshi Twig Pearls and Denim Aquamarine beads with 22kt yellow gold links, a Denim Aquamarine Drop and an 18kt yellow gold hook clasp set with a Diamond (.015cts), 24″ total length. 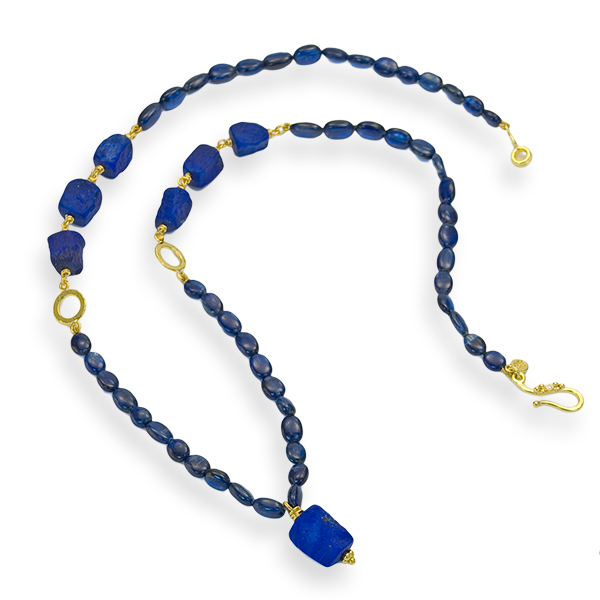 Necklace has one strand of Kyanite lentil beads and Lapis surface beads with 22kt yellow gold links, a Lapis drop and an 18kt yellow gold hook clasp set with a Diamond (.015cts), 21″ total length. 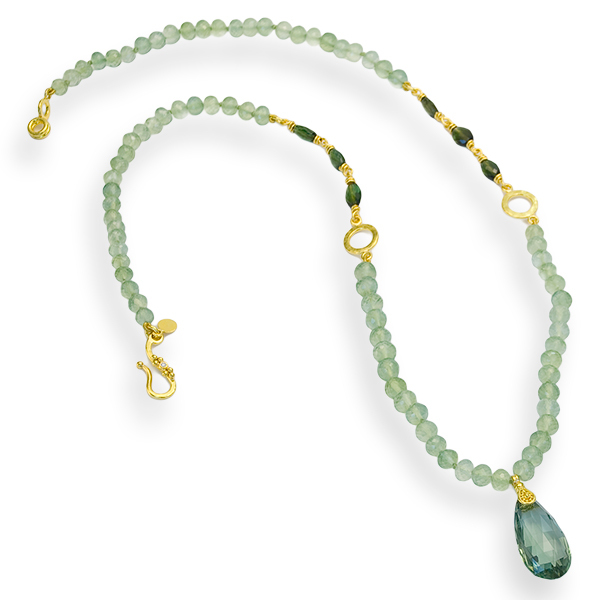 Necklace has one strand of Prehnite faceted beads and Green Tourmaline beads with 22kt yellow gold links, a Prasiolite briolette drop (24x12mm, 12.17cts) and an 18kt yellow gold hook clasp set with a Diamond (.015cts), 21″ total length. Necklace is set with Diamonds (.13tcw) in a granulated 22kt yellow gold station on an 18kt yellow gold rolo necklace, 2.4mm in diameter and 18″ in length. 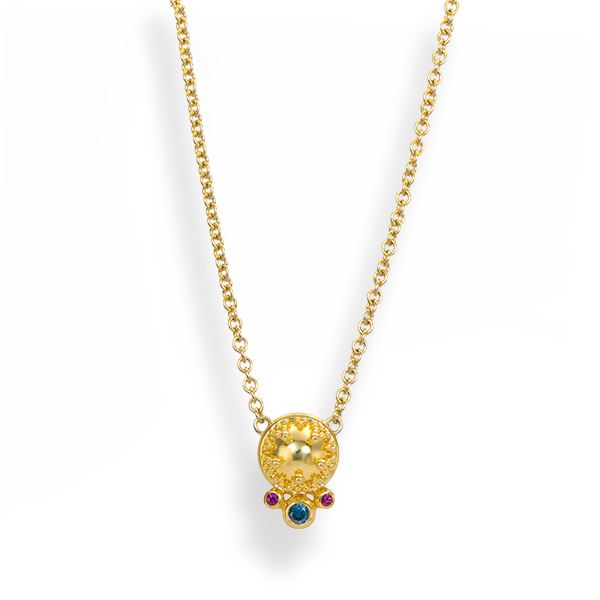 Necklace is set with a Teal Diamond (.07cts) and Hot Pink Sapphires (.04tcw) on a granulated 22kt yellow gold button (3/8″ in diameter) on an 18kt yellow gold 2mm cable chain, 18″ in length and adjustable to 16″. 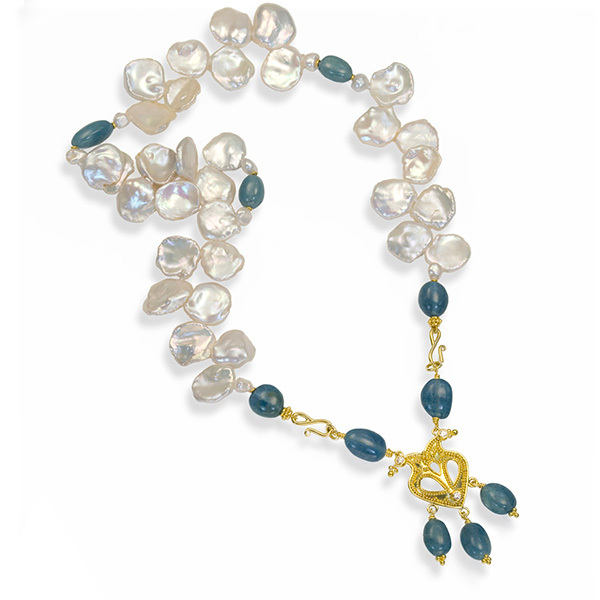 Necklace has one strand of White Freshwater Petal Pearls, White Freshwater Keshi Pearls and Denim Aquamarine beads with 22kt yellow gold spacers and a removable lavalier in granulated 22kt yellow gold and 18kt yellow gold set with Diamonds (.21tcw) and Denim Aquamarine beads. 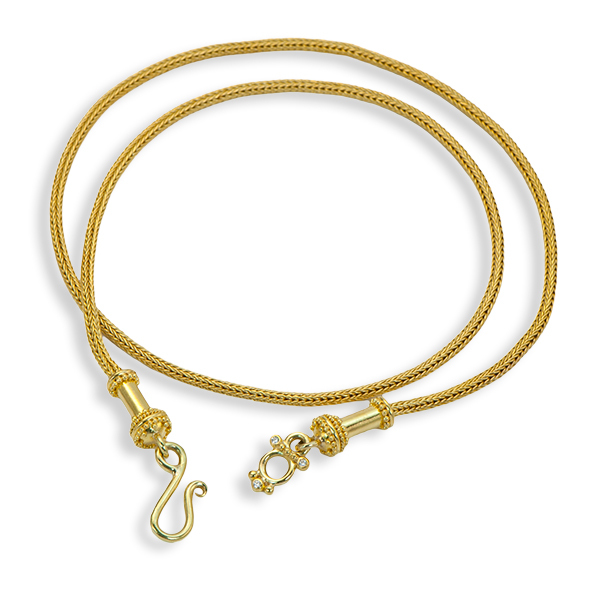 This is a convertible necklace designed to be worn with or without the lavalier. 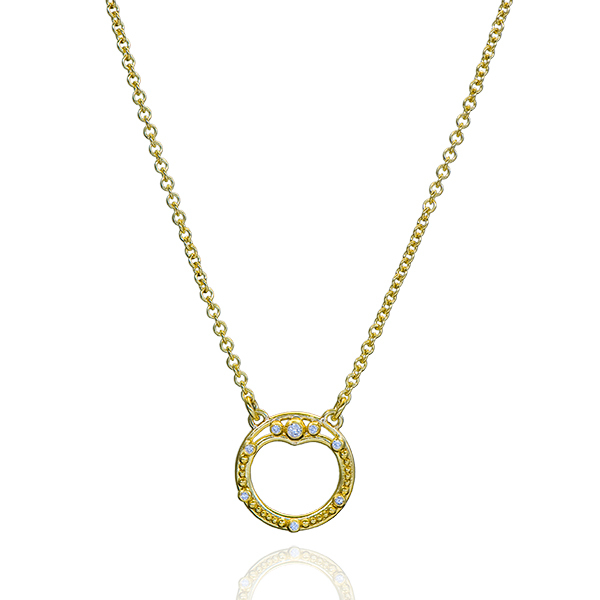 When the lavalier is removed, the necklace has a simple 22kt and 18kt yellow gold clasp with one Aquamarine bead. Total length: 17″. Necklace is a 2.25mm handwoven 22kt yellow gold roman style chain with granulated 22kt yellow gold end caps and 18kt yellow gold clasp set with Diamonds (.03tcw), 17.5″ in length. 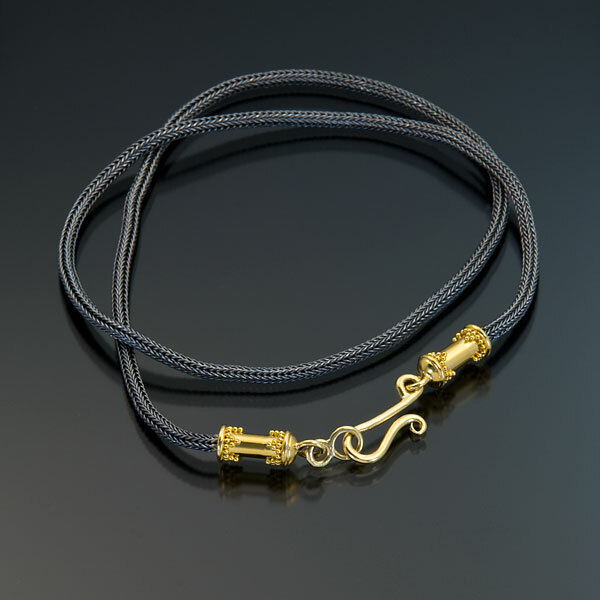 Necklace is a 2.0mm handwoven fine silver roman style chain with granulated 22kt yellow gold end caps and 18kt yellow gold clasp, 16″ in length.